This third book in a trilogy about Marcus Tullius Cicero has much going for it, even as it suffers pitfalls typical of biographical fiction on a grand scale. The subject is certainly worthy. Ancient Rome produced few men whose range of accomplishment rivaled Cicero’s–senator, consul, historian, philosopher, legal advocate, and, not least, the most gifted orator of an age that valued public speaking. What’s more, and perhaps what makes him such a tempting fictional protagonist, he knew everyone who was anybody, as friend, enemy, or (often) both. As this volume begins, Cicero’s in exile from Rome. That would humiliate anyone but especially a man used to power who believes he has upheld its dearest principles. His marriage, never particularly happy, seems more like a tenuous accommodation than a supportive partnership, while his beloved daughter, Tullia, is suffering her own marital problems. 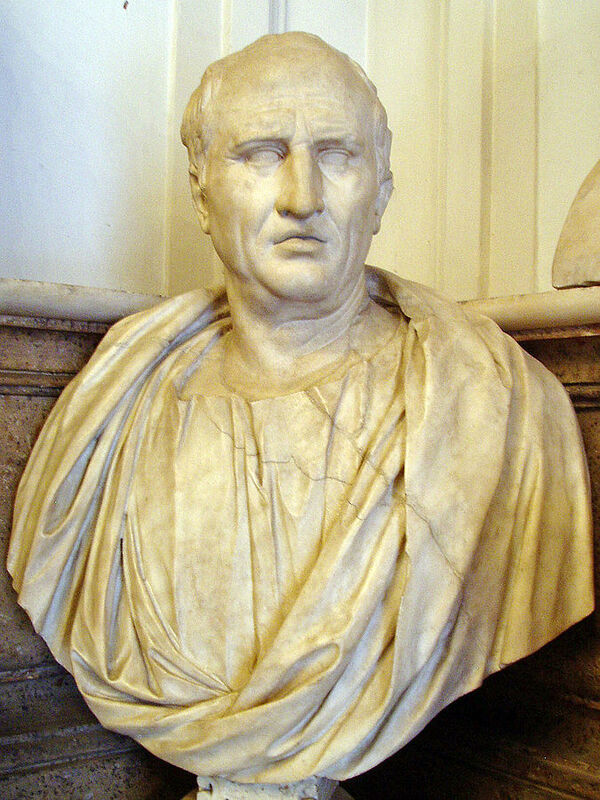 By promising to support Julius Caesar, a political enemy, Cicero regains the right to return to Rome. But as this experienced, adroit politician knows too well, such a bargain brings as many dangers as possibilities, just as he recognizes that Caesar is a man ill accustomed to hearing the word no. In other words, Cicero has little choice. Therein hangs a tale, and a fine, often familiar one it is–the tense rivalry between Caesar and Gnaeus Pompeius Magnus (Pompey), which devolves into civil war; Caesar’s dictatorship; what, thanks to Shakespeare, may be the most infamous assassination in history; and its aftermath. But to read Dictator makes you realize how much Shakespeare compressed, edited, changed, or simply invented. And knowledge of the history in no way dampens appreciation of the book. One reason I admire Harris’s novels is his skill at making tense drama out of well-known events, as with Aquarius Rising (about Pompeii) or, my favorite, An Officer and a Spy (about the Dreyfus Affair). Among other things, that implies a talent for characterizing famous people, and here, they include the two Caesars, Julius and Octavian, as charismatic as they’re cold and calculating. He should have heeded the example of Socrates, who said that death was preferable to exile. Yes, he should have killed himself! He snatched up a knife from the dining table. He would kill himself! I said nothing. I didn’t take the threat seriously. He couldn’t stand the sight of others’ blood, let alone his own. All his life he had tried to avoid military expeditions, the games, public executions, funerals–anything that might remind him of mortality. However, Tiro’s narration, witty and ironic as it often is, keeps raising the unspoken question: What about the man telling the story? Who is he, really, aside from being Cicero’s scribe and shadow? Like any devoted chronicler, Tiro puts himself in the background, but this isn’t always satisfying. Harris has him refer to himself as invisible, meaning nondescript, but I’m not buying. Tiro may be the conveniently overlooked witness to great events, but he’s a character too, and deserves more. It’s as if Cicero and the Caesars use up so much oxygen, there isn’t enough to go around, which leaves the minor characters less able to live and breathe. Conversely, though Cicero enjoys being the center of Roman attention, he has his humdrum years, like anybody else, so that Dictator occasionally drags, despite Harris’s prodigious storytelling skills. The novel offers other pleasures, though, not least a window on Roman politics: endless cabals, corruption, backstabbing (literal and figurative), and reversals, whose participants have long memories and sharp tongues. That Cicero, an intellectual for the ages, would attempt to make sense of this cesspool in which he waded is quite understandable, and his analyses sound as cogent today as they did two thousand years ago. For instance, when he asks, “Must the existence of standing armies and the influx of inconceivable wealth inevitably destroy our democratic system?” you can’t help thinking how prescient the ancient philosopher was. Likewise, when he supposes that a human can only prepare for death by leading a morally good life (essentially by following the golden mean), I find myself having to stop to reflect on that.